This is Sage out Annie by NZ. INT'L. CH. Croftsway Old Man River, CGC "TomTom". She went to the LRCP double senior hunt test and qualified both days. She got her Junior Hunter Title with 4 passes in a row, and now has 2 of her Senior passes. She has never not qualified at a hunt test. Her owner had people coming up to him both days telling him how beautiful she was and that she should be in the show ring. Then today when they were handing out the ribbons, the judge told him that he his dog hunted the best out of all of the entries. She told him she wasn't sure if he knew what a great dog he had, but he does. She will be running a field trial Derby next month and should finish her SH title this fall. She is also going to get her feet wet in the show ring. All of this and she is chocolate! We are so proud of her and can't thank her owner enough for doing so well by her. Update: Sage is Derby Pointed,and easily finished her Senior Hunter and Master Hunter Titles. She is now running field trials, not a small feat for an English lab. She is Qualified All Age in field trials. I have just started a bit of training with Doma as she is showing great natural talent. She runs as fast as any of my field trial bred English labs or springers and they are very fast! 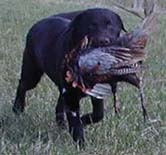 Her retrieving is spot on and she never gives up on a mark, she has everything going for her, eye contact, trainability, the want and need to work and please you, tender mouth, she really uses her nose on scents quite naturally. We hope to show her at the end of the summer for the first time in the ring- it's quite exciting as to how she does. p.s. Her coat is so amazingly thick and waterproof, everyone comments on it- some have asked if she is crossbred with a grizzly bear!! 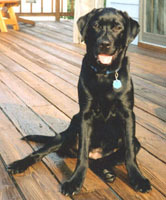 "Scout is such a wonderful dog -- an all around sweetheart! She loves everyone and is very gentle with children. Dog professionals often make comments about what an especially kind dog she is, and total strangers come up to my husband and I and say, "Now THAT is a beautiful dog". She brings us so much joy and is an integral part of our family! She always wants to please us and, literally, would not hurt a fly. I knew I would like having a dog, but I never expected how much I would love owning Scout!!! Thank you Crystal Kennels!" Abby's the greatest! Super temperament, great coat, x-ray vision (almost) - a real head-turner. Thanks for your good care to get her started right. Snicker has been a blessing to me. He is one of my loves of my life. He snuggles with me when I am sick and plays with me when I am feeling great. He is always there to give me kisses and hugs when I need them. Snicker is a great part of my life. I am so thankful that Jenifer gave me a chance to have him. I wouldn't give him up for the world. 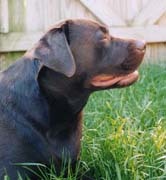 Godiva, our chocolate lab, is the smartest, sweetest dog I've ever known. She was completely house broken in two weeks and we took her home when she was only 8 weeks old. She is also beautiful and gentle. Most important she is very healthy and strong. She has brought great joy to our family and we could not imagine life without her. The addition of our heartdog, Cooper, has made for many entertaining moments. He loves to hang out in the bathtub and await a shower or a good drink. He is a loving, devoted friend with the heart of an angel. "Tooie" is a dear sole. He loves to watch animal planet with his mama and pretty much anything else that involves laying on the couch. 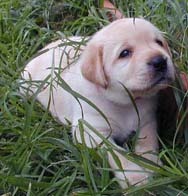 I waited a long time to get a Lab puppy and I did my research about breeders on the Internet. That is how I found Crystal Kennels and I was most impressed with my first visit to meet Jenifer, Chad and the dogs. I put in my bid for a chocolate female from Rose. After the litter was born, I visited them every week so I could watch them grow and develop as individuals. These puppies got to a great start between the care from Rose and from Jenifer. My puppy, Bruni, is an absolute joy. She is really a beauty and everywhere I take her I get asked where I got such a beautiful Lab. Crystal Kennels, of course! 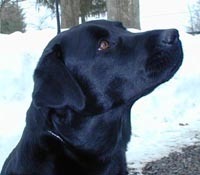 Bruni is also highly intelligent and a fast learner. It is a significant testimonial that I thought enough of Crystal Kennels to recommend them to my boss/friend. 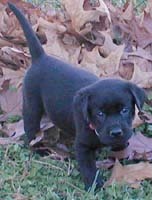 Bravo to Jenifer, Chad and the Labs of Crystal Kennels! Our puppy Cricket is the smartest dog we've ever owned. We are training her to hunt and there is nothing I have tried to teach her that she hasn't picked up on immediatly. We have every expectaion that she will turn out to be an excellent water dog. I anticipate being able to start her in Hunting Field Retriever Field Tests by the time she is 6 months old. She is also a very pretty dog and attracts much attention when I have her out in public. She has a beautiful shiny coat and a very handsome face and gorgeous head. She has made us into sentimental fools. We are very proud of our girl Cricket. 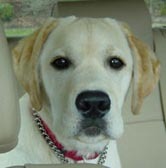 Added note: Cricket passed her CGC & her first qualifying run for her Started Retriever Title at 6 months of age. 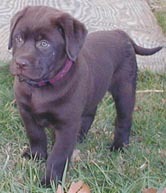 I spent a lot of time looking for a chocolate lab. I found Crystal Kennels and a could not be happier. We got a beautiful, intelligent, well trained and loyal puppy. She is a wonderful companion. We feel very lucky that we found Crystal Kennels and Jenifer. I have owned several dogs in my life and I can tell you Keni is the most entertaining. He is a lover and wants to touch people all the time. He gets lots of compliments when we go out with him and he eats it up. He is gentle and seems to understand everything you say. If I ever to get another dog, it would be from Crystal Kennels. Chrystal Suki Sahimi Kirk is a sensitive lovely family member. She behaves well, and reponded well to obedience class. 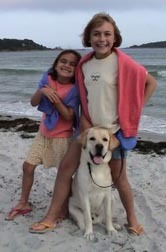 She is loving with children and has accepted a new puppy playmate with grace. She is sound in constitution and has a gleaming coat. Also, I can attest to Jenifer's abilities and knowledge. She has been helpful and caring long with our animals.